Tossing It Out Tossing It Out: What Do You Think of Musical Theater? Yesterday was my Battle of the Bands post. If you missed it or didn't vote yet, be sure to visit my BOTB post . Also stop by to vote at the sites of the co-hosts Far Away Series and Ferret-Faced Fascist Friends . Keep in mind that there is a prize for the most frequent voters. 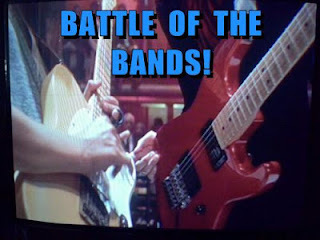 Some others who put up their own Battle of the Bands posts can be found at Your Daily Dose and DiscConnected. Since the Battle of the Bands theme of the host blogs matched up different takes on songs from the hippy era musical Hair, that got me thinking about musical theater as it was in its Golden Age, where it started going in the 1960's, and where it has come to now. I grew up on the traditional theatrical musicals such as those by Rodgers and Hammerstein and those light works of stage entertainment filled with music in the vein of the old standards and fun show tunes. Those presentations probably look old-fashioned to anyone more familiar with the musicals of the post 60's. Some of the old-school musicals are now and then revived by professional and semi-pro companies and are presented on high school stages that still have the money to present extravaganza stage productions. But musical theater has changed a lot since the 1950's. When I was a kid in the 50's and early 60's, my parents took me to see a number of live stage musicals and many of the movie versions of the popular musicals of those times. I enjoyed these until I reached my teens and that's when I began to take a more cynical view of musicals. It began to seem kind of dumb for people to just break out into song. Rock and roll was where it was at for me and musicals were passé. That is until they became relevant for me. Hair and Jesus Christ Superstar caught my attention with good music and good songs. Musicals were in my musical radar once again. Then for the next couple decades I was involved in touring groups that could be considered as musical theater and for a brief period actually played in the band for a musical at a dinner theater in Virginia. I began attending musical productions whenever I had an opportunity. Now in my current stage of life I would still count myself a fan of musical theater, but more so the old school styles that I grew up with. I love Evita but don't have the least bit of interest in the musicals of recent decades like Rent, Dreamgirls, or for that matter Les Miserables. I want my musicals to be fun or at least have songs that I might be singing later. A lot of the innocence of musicals is gone, Now they often are more raunchy and filled with bad language--probably partly as a result of musicals such as Hair. Or they deal with social issues or ridicule conservative or religious values. Of course since I have distanced myself from the world of musicals and theater maybe I'm misreading things. I'm going by what I read or hear about in the media. And I don't think much of most of the media either. I've changed a bit over the years. Now you might call me an old fuddy-duddy. Or you might think I'm spot on. What do you think of musical theater? Do you think musicals used to be better or do you like the direction they've taken? What is your favorite musical? What is the last musical you've seen live on stage or on screen? As a musician in college, we played a lot of those older style musicals. I've also seen plays such as Les Miserables (in London with the original cast.) I can appreciate and enjoy both. I have to admit Lee, I've actually never been to the theatre before, I don't know why, it's just something that hasn't came around, I'd love to check out a musical some day because I do love the concept for sure. Like you, I grew up with Oklahoma, South Pacific, West Side Story, My Fair Lady, etc. And I love them - still watch them today - over and over. But I also love today's musicals like Les Mserable, Phantom of the Opera. If the story appeals and the music is compelling, I'm in. I love the movie Hair! Good ol' George Burger. We saw Showboat with Howard Bosley years ago. And Fiddler on the Roof. Excellent shows! I love musicals. Not all day or every day, but I do enjoy them. I've never liked musicals because people do not naturally break out into song. I did enjoy Hair, though. I love musicals, and my fav is The Phantom of the Opera, also enjoy Chicago,and Dreamgirls, but have put off seeing Les Miserables, I hate to cry! Alex -- I always enjoy a live stage production. Yeamie -- Hope you get to see a stage production soon. It's an exciting experience. Karen -- For me it's mainly about the music. A good story is a plus. Steve Tremp -- I'd never seen the Hair until the last couple years after I bought the DVD. Teresa -- I've got to be in the right mood. Musicals are one of my favorite film genres. L.Diane -- I used to have a problem with the breaking out in song thing. Now I accept it for what it is and appreciate musicals as such. Yolanda -- I have the Phantom soundtrack on CD, but I've yet to see any of these more recent musicals. For one thing, my wife is not a big fan of musicals and I usually don't like to watch them by myself. The last musical I saw on screen was very recently - within the last 6 weeks. It was 'BELLS ARE RINGING' with Judy Holliday and Dean Martin. I like that one and have seen it several times. I was always under the impression that, with just a few exceptions, I did NOT like musicals. But then, a couple years ago, I was yakking with someone in a blog comment section about musicals, and I wrote something along the lines of: The only musicals I like are ___ and ___. Oh, and I also like ___. Well, actually, I also like ___ and ___. And I forgot that I kinda like ___. And ___. Well, by the time I got done listing the musicals I like, I had to laugh because it was entirely obvious that I DO like musicals. There are some musicals I most definitely DO NOT like (I'm looking at YOU 'West Side Story'!) but overall, I do enjoy them, despite the fact that if this ever becomes common knowledge I will lose my 'Man Card' over it. I never saw 'HAIR' on stage, but I am a big fan of the movie version, which I own on DVD. among others. I consider movies like "Mary Poppins" and "Chitty-Chitty Bang Bang" musicals because they have so many songs. Those are two more favorites. I also love "Les Mis," not because it's a feel-good story, necessarily, but because of the powerful message of the story and the incredible music. Last year's movie version was really well done, IMO. The only musical I've seen professionally performed live was "The Phantom of the Opera," my senior year of high school. It was amazing to see that done on stage! I love musical theatre. When I was in the 9th grade, two of my friends and I auditioned for the local community theatre production of Jesus Christ Superstar. Of course, we were only in the chorus, but that meant a lot of dancing and "face time" in that show. It was a wonderful experience. We had so much fun that the next year we auditioned for Camelot and again were in the chorus. It was another show with lots of dancing and singing for the chorus. Loved both musicals enormously. In high school, I was in the chorus for Oklahoma! and it was tons of fun. My senior I played Mammy Yokum in L'il Abner and that was the BEST. Of course, I enjoy watching musicals, too. I haven't been recently... this post is a great reminder that I need to see what's playing! StMc -- I'll disagree about West Side Story. I think Bernstein's scoring and songs is quite good. What did you not like about this musical? I'm surprised that you would disapprove of that musical yet consider yourself of that hippie musical Hair. Jaimie - I think the stories need to be somewhat light and not content heavy to allow for the songs and the dance numbers. Usually the audience is there for the entertainment value and not so much the story. Robin --It's fun to be a part of a production especially if you get be on stage and feel the audience adulation. Applause can be addictive. I love musicals, old and new, although have steered away from some newer ones for the same reasons as you. I do not enjoy watching films of musicals, however-would rather see a high school production of West Side Story than watch the film, even though I like the film....I just like to hear music live more. A little trivia for you...Joseph Papp hired Todd Rundgren to write the book for a musical called Up Against It that played for a couple of month run at New York's Public Theater (off-Broadway). I was lucky enough to see it. The story was originally meant to be a Beatles film, and that showed (a little silly) but Todd did a great job with the music and lyrics. A song that frequentl makes my top list, Parallel Lines, was a recurring theme in this musical. I hear his next "orchestra" show (with Metropole) will be this musical. But I digress....and this is YOUR blog, not mine! I must drive by our local theatre quite often and I don't recaLL it ever emitting music. The lazy inconsiderate people who work there are poor in their aim at the trash dumpster in back in the alley and fiLL it past the brim when another emptier dumpster is just a few feet farther north. So their spiLLage drifts north up the aLLey towards our place. So it is more of a Trash Theatre when it comes to emissions. We've been watching musicals with our kids lately, including Jesus Christ Superstar. My kids have especially loved The Sound of Music and Singing in the Rain. They did not much care for Oklahoma! Larry -- You are welcome to take up as much space as you want on my blog. Guest post? Sure, if you've got something you want to share. There is something special about live music, but I can certainly appreciate movie musicals. They can do things that are difficult to pull off on stage. esb- When you consider a lot of garbage that's been in the theater of late, "Trash Theater" is an accurate moniker. And when theater gets a bad name they harm moniker. Andrew -- I used to give my kids a regular diet of musicals when they were growing up. I don't know if they still watch them, but we had a good time watching them. Or at least I did and I hope they did too. I can't remember when last I saw a GOOD staged musical. I'm talking about the likes of West Side Story, Oliver, Fiddler On The Roof, The Sound Of Music, Porgy and Bess, Cats, Joseph and The Amazing Technicoloured Dreamcoat, My Fair Lady, Phantom Of The Opera...etc. I have nothing against the modern types though, and have watched quite a few of them. Musicals are fun! As a tapper my fav has got to be 42 Street! I haven't seen any musicals except for the ones my high school puts on. They stick with the classics with no political overtones. Faraway -- I'm not sure why Jersey Boys would require use of bad language. If the music is good I could get past it. Like I get past the language in well scripted films like the real estate one that I can't remember by the playrite I can't remember. Michelle--You've named off some good ones. Southpaw -- Love the old version of 42nd Street from the 30's. I'm sure the newer one is also good if it follows suit. Susan GK -- I'd rather see a high school group keep it clean with a classic musical. StMc -- All I can think of would have something to do with gangs and musicals. If that's the case then I'd have to plead willing suspension of disbelief for my part. Did I get the answer? Otherwise I can see nothing to fault with the music. The story line is basically Romeo and Juliet so I don't have a problem there either--a rather innovative twist I thought. i LOVE musical theater!!!! can't wait to see more and more! I also love musical theater! I've enjoyed plays ranging from The King and I to The Producers! I even liked The Book of Mormon, but it's not for everyone. I've always loved 'live' performance in whatever discipline, but you can't beat a good blockbuster musical! Thankfully, we are able to get to London's West End fairly often, even if we often do have to sit in the 'cheap seats' (gosh - the PRICE of tickets!! :-o) but we're also blessed with many large theatres nearer to home so we can take advantage of touring productions. Now we are reduced to just a few long-running shows like Les Mis, Phantom and Wicked because producers are less likely to take chances on long runs for new shows. Last show we saw in London was 'Once' - initially I was unsure, but it is a wonderfully uplifting show with fantastic music - played by the actors themselves! Go see it, if you can! But people-pressure can have it's rewards to bring back musicals - and after joining in the clamour of voices and bombarding emails to theatre impressario Cameron MacKintosh, I'm thrilled to say 'Miss Saigon' is coming back to the West End! It broke box office records when tickets went on sale last week (£4.4Million on the first day!) - and we have three of them!!! :-) I have to admit it is my favourite musical, so many beautiful songs - we followed it round the country (I think we saw it 11 times) - even a student-production we saw last year was gobsmackingly awesome! I enjoy musical theater, both old and new productions (although my idea of new is The Phantom of the Opera). There's something wonderful about a cast of people bursting out into song and not being seen as eccentric for doing so. I burst out into song all the time at home! I'd love it if life was accompanied by a soundtrack! I love "OKLAHOMA and CAROUSEL" I could watch these as many times as I watch Daniel. Great post Lee Music was the first love in my life and I still love it today. Tammy -- It's a different kind of entertainment. Julie -- Not how I'd respond to Book of Mormon. It has been all the rage in recent years. Sue H -- Wow! You are a fan. The cost of going to see musicals is the biggest drawback for me. For me the music trumps staging and effects. Spectacular visuals may astound and stick in the memory, but good songs can stay around longer. Joyce -- Since I grew up listening to the Four Seasons I'm sure those songs would be on my mind. Jen -- Okay, I'll admit that I also burst into song sometimes though it's usually when I'm alone. Yvonne -- Your picks are two of my favorites as well. It's hard to beat those musical scores. I love musicals! You get everything all at once and its a great experience. Musical theater left the viewer with a better outlook on life, as it usually dealt with universal issues and the end result was happy. Now? It has become an art form where the viewer is expected to be insulted and challenged. Never come away humming a memorable song for those. There are still plenty of feel-good musicals with hummable music. You probably just don't keep up with them like you used to. Or maybe it's just the fact that they don't make them into movies anymore. (Let's face it, most people know the old Broadway stuff from the movies.) There are also current musicals that explore old music, like the current musical about Carole King, or Jersey Boys (about the Four Tops). KT -- Musicals can be great fun. Susan K -- You expressed well the way I see it. Kelly -- True that I don't keep up with a lot of the new musicals. I'm not sure about the musical shows based on old pop hits. I like the songs and I guess that recognition is what the production companies are counting on to get their audiences. By the way, you probably know this but just put it down wrong, Jersey Boys is about Frankie Valli and the Four Seasons. I love their music as well as the Four Tops. Ha, you are right. I meant to say the Four Seasons! Many people who do not like musicals mention: "People just don't break out in song." But if they can think of it as just a play (which they might like) set to music, then it is easier to accept. I love musicals. I also love football and violent movies, so that may even out the "man card" issue. I have attended probably over 100 in my lifetime, mostly high-end productions, but some high school musicals as well. I agree with those who have said that modern musicals can be high quality, but I do think that - as with all of current society - standards have fallen some. Older musicals such as South Pacific, Oklahoma, Carousel, etc. were written by people who, over a body of work, demonstrated their genius. A modern composer who has clearly done so is Sondheim. His musicals are excellent and have brought wider appeal to musicals in general. I've even see Hair onstage, though I hated it. I'd paid for seasons tickets that year and it was one of the productions, and did not want the tickets to go to waste. Not a fan, as you know from your BOTB blog. It is of the class of modern musicals that may be more fun to "experience" than they are to listen to the music. At least to me. Still others are just written to make someone money they see laying on the table. An example of that is "American Idiot, The Musical" by Green Day. Now, I actually really like Green Day, having attended at least three of their concerts. But the musical was just stupid. They tried to write a story to weave together the songs from the album... and it was a failure. Except that I'm sure Billy Joe Armstrong made a s**tload of money. Since musicals are just plays set to music, it stands to reason that the music will reflect what is popular in the era. Operas were the "musicals" of their day. They reflect the music, vocal style, and libretto themes popular at the time. And I love opera, too. We've often bought season tickets to the opera if the lineup looks good. Thanks for the blog bit! "People just don't break out in song." But if they can think of it as just a play (which they might like) set to music, then it is easier to accept. It's kind of like the willing suspension of disbelief. In a musical people do break out in song and if there is context and the transition is smooth it's easier for me to accept. I love the way that it was done in Steve Martin's Pennies from Heaven. Totally absurd on the face of it, but in the context of the story the breaking out in song idea was brilliant. Hair is a mish-mash mess musically as far as I am concerned. musicals such as South Pacific, Oklahoma, Carousel, etc. were written by people who, over a body of work, demonstrated their genius. As opposed to the guys who wrote Hair. Nothing worth mentioning came later other than for the composer of the music. Operas were the "musicals" of their day. They reflect the music, vocal style, and libretto themes popular at the time. Operas as well as the classic musicals and those of Rice/Webber or other combinations are exquisitely composed, scored, and staged. They have lasting value. A lot of today's musicals are so topical that most of them will be dated and uninteresting to most in a couple decades. Like Hair.